It was with shock that we learnt of the sudden death of Louise Zanré last month. Louise had just retired from her post as UK National Director of JRS (Jesuit Refugee Service), Wapping London, to take on a lighter job of avocation for Refugees, which was her life-long passion. Louise who had experienced sadness in her own personal life was able to resonate with those people who were displaced and often considered as outcasts in life and society. For some years, Louise suffered some medical problems but she never shied away from a full time commitment to work in Wapping and overseas and often gave courses on Justice Issues around the country. 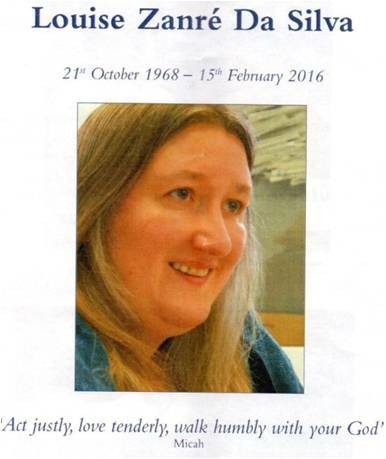 She was a wealth of information regarding issues of justice and the law, having a legal background she kept abreast of all the most recent policies coming from the Home Office and Government regarding Immigration and the status and Human Rights of Refugees and Asylum Seekers. The recent events of the last year has laid heavily upon her heart and she was never afraid to speak her truth regarding the dignity of peoples amidst politics and game-playing that goes on regarding the movement of people and the plight of the displaced. Louise’s strong legal professionalism assisted those of us who learnt from her the importance of the witness to both our “Corporal and Spiritual Works of Mercy”. Welcoming the stranger she touched many lives for those who came to the Hurtado Jesuit Centre, Wapping as a refugee, asylum seeker, or simply as friend and together with religious and lay volunteers and her team of workers shared hours of dedication for the care of the stranger in our country and for those working for the spiritual and pastoral care of detainees in detention at Heathrow. It was a privilege to have met and worked with Louise and she will be greatly missed not only by these who knew her in London but by many people whose lives she touched over her short 47 years. Indeed she was truly a Woman of Mercy for our times.